We are now living in a digital information era, which is fundamentally changing science and society. Maps and further cartographic means, which communicates information tailored to human users through various media, play a key role in this information era. This is related to the fact, that we can witness that more spatial data than ever is produced currently. Numerous sensors of all kinds are available, measuring values, storing them in databases which are linked to other databases being embedded in whole spatial data infrastructures, following standards and accepted rules. We can witness also that we are not short of ever more new modern technologies for all parts of the spatial data handling processes, including data acquisition (e.g. UAVs currently), data modelling (e.g. service-oriented architectures, cloud computing), data visualisation and dissemination (e.g. Location-based Services, augmented-reality) allowing us to acquire, store, link and process more and more data. The problem is often not that we don't have enough data but rather too many. We need to make more and more efforts, to deal with all those data in an efficient sense, mining the relevant information and link and select the appropriate information for a particular scenario. This phenomenon is being described as "big data". However, the particular need, demand, question or problem of a human user is often taken into account only when the data-driven or technology-driven application, product or system has been built. Often this causes problems or leads to products, systems and applications which are not accepted, not efficient or simply not usable. By starting from the question what are the demands, questions, problems or needs of human users in respect to location we could eventually apply data and technology in a sense, that they serve such user-centred approaches rather than determine the use. In this contribution it will be argued, that maps and cartography play a key role in this respect as cartography works with abstraction, narrations and holistic views to allow for efficient and effective interfaces between data and humans. In order to allow for a general context the ongoing evolution and research trends of the scientific field of cartography are analysed. It then presents a series of key research challenges that are essential to advance the development of modern cartography, setting a research agenda for cartography to “positively” contribute to the future of our information society. These research challenges cover issues related to the core of cartography, as well as those imposed on cartographic research from societal perspectives. Georg Gartner is a Full Professor for Cartography at the Vienna University of Technology and head of the Research Group Cartography. He was Dean for Academic Affairs for Geodesy and Geoinformation at Vienna University of Technology. He is responsible organizer of the International Symposia on Location Based Services and Editor of the Book Series “Lecture Notes on Geoinformation and Cartography” by Springer and Editor of the Journal on LBS by Taylor & Francis. 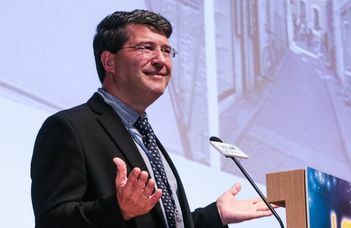 He serves as Past President of the International Cartographic Association, as Vice-President of the Austrian Society of Geodesy and Geoinformation and is a member of the Academic Network of United Nations Global Geospatial Information Management.